A PLEASANT DIVERSION--Seeking a diversion from the ongoing horrors of the Napoleonic Wares, Simon Altmont, looks forward to a liaison with the attractive woman in his bed. She would make a perfect new mistress! He soon learns just how different his mysterious Mrs. Logan really is. 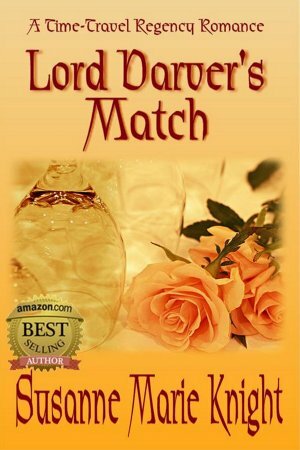 Has the Marquess of Darver finally met his match? On assignment in the past, Serenity attends her first “haut ton” ball. As she studies the notorious rake, Nicholas Wycliffe, Lord Brockton, she finds him studying her. Hillary’s cheeks radiated heat. She knew her face had to be the color of her nightshirt--shocking pink. She was standing there half-naked in front of the most desirable man she’d ever come across--and a stranger to boot. Her frankness surprised her. She shrugged it off as a case of the nerves. Who, in her position, wouldn’t be nervous? Who, in her position, wouldn’t be nervous? She tapped her foot. How dare he make fun of her speech when he sounded so... so British! The man knew he was infuriating. He knew it. Hillary frowned but followed his suggestion. His gaze moved over her bare feet, lower limbs, knees, and partially exposed thighs. She tried to pretend his scrutiny didn’t bother her but if her face got any hotter, she’d scorch her eyebrows. She balled her fists. What she wouldn’t give to floor the man. But she was in no position to argue. “If you please.” She spat out the words. He turned to her and used the door as a barrier to hide her from Finch. “Jim what, my dear?” he asked, not bothering to hide his amusement. His eyes crinkled merriment at her predicament. Damn the man! Hillary concentrated on keeping her voice cool. “Jim Logan,” she said succinctly. As if that wasn’t embarrassing enough, her stomach decided to roar. Even Finch must have heard it. In that moment, there was nothing Hillary wanted to do more than to murder the man.